When I stayed at a friend’s house in November, I was crazy-impressed with her exterior door locks. Yes, I know, it was a strange takeaway, but they were that great! She had the Schlage Sense Smart Deadbolt™ system, which is a keyless electronic lock. 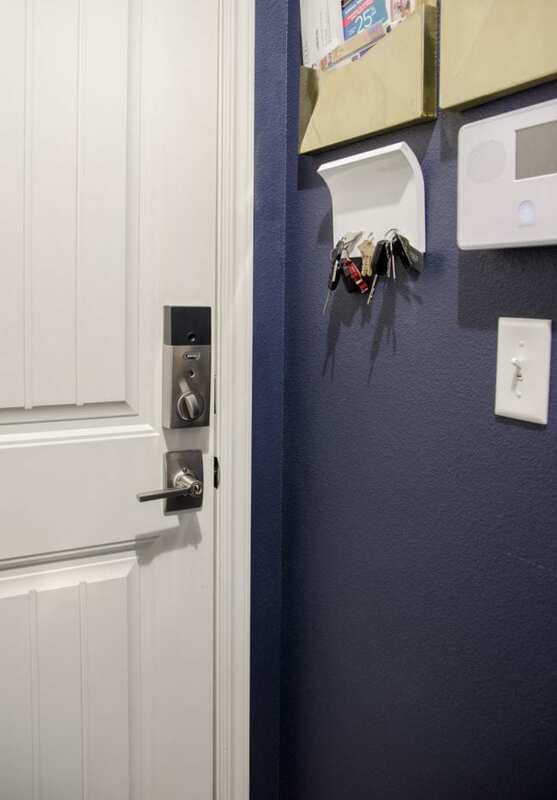 I had considered keyless locks for our house in the past, but living with them for a few days made me realize how much easier they really make day-to-day life. I came home and started researching options right away. 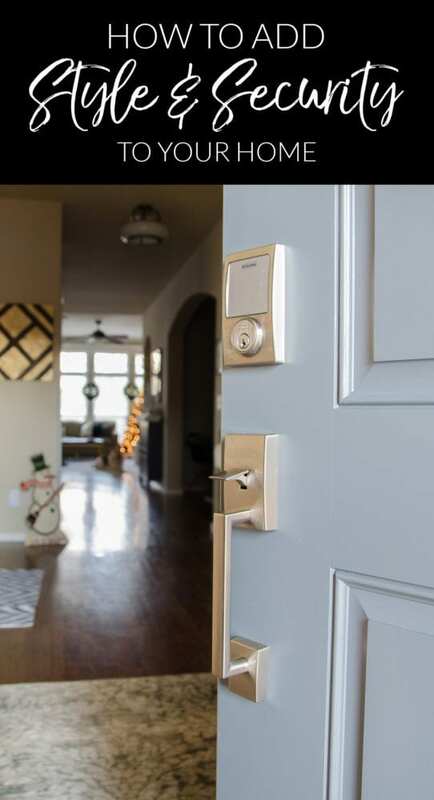 The same Schlage Sense had all the features we wanted, and I reached out to Schlage to see if they’d be interested in working with me to share the awesome product with you. They agreed, so here we go! Before we installed the new knobs and locks, I took the opportunity to paint the front door. The outside had been brown since we moved in, and has always just been okay. We had decision fatigue when it came to the exterior paint, brick and stone when we were building, so we literally found another house by our builder that we liked and told him to replicate those colors. 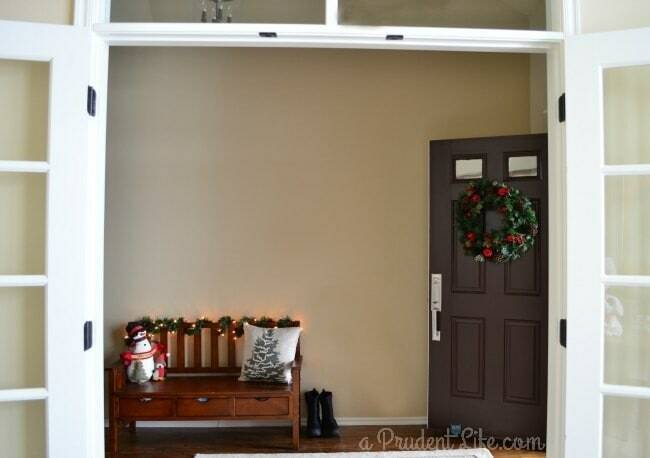 Here’s what the exterior of the door looked like. Inside, the door was white and also fine, but ever since we painted the inside of the back door, I’ve been dreaming of painting the front door too. 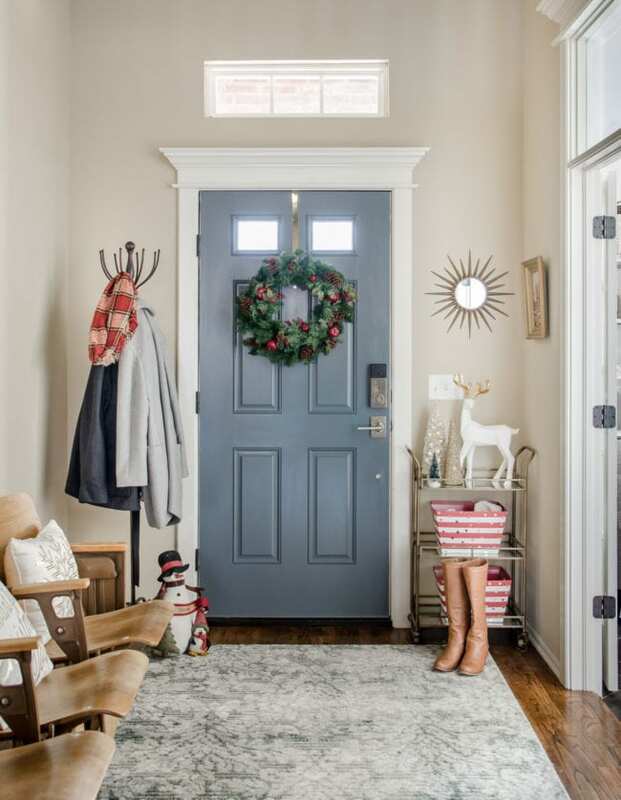 When we finished the dining room last month, I knew the darker accent color was ideal for the front door and that replicating the color would help tie the spaces together. I liked the color so much that we used it on both the inside and outside of the door. Because our existing deadbolt and handle were one unit, we needed a new handleset as well. 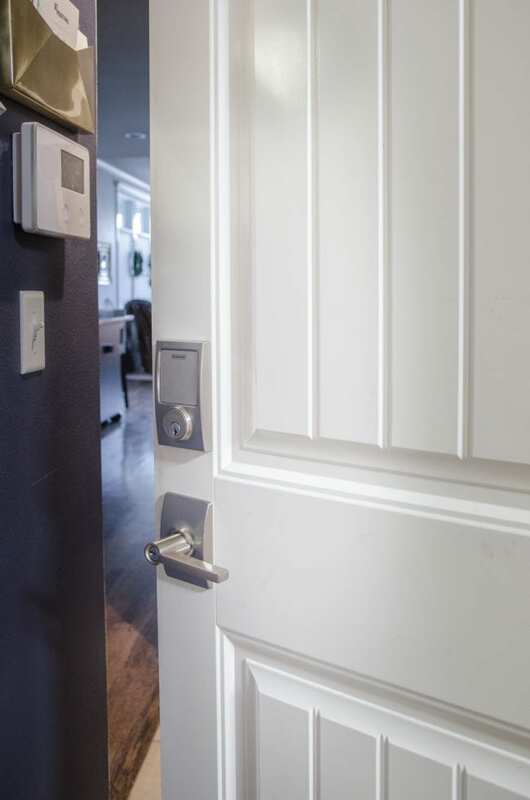 Schlage has several options available in different styles, but we really like the look of the square lever Century style, which matches the Century Sense we chose. 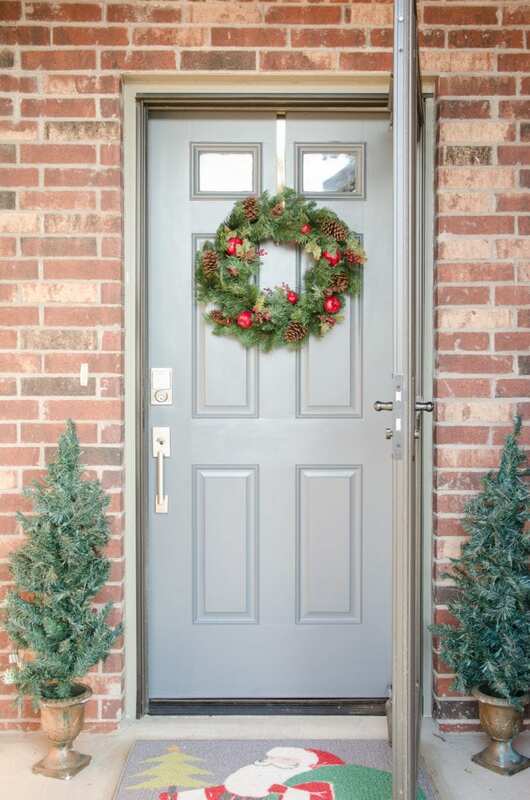 If your style is more traditional, check out the Camelot trim option for your Sense & handle. The satin nickel finish really pops against the darker door too. Doesn’t the new color look great with the brick? It’s a great blend of modern and traditional, which is perfect for our style. Now I’m counting down the days until spring so I can paint the shutters this color, too! I really like that the keypad outside only lights up when you touch it. It looks so sleek and modern! 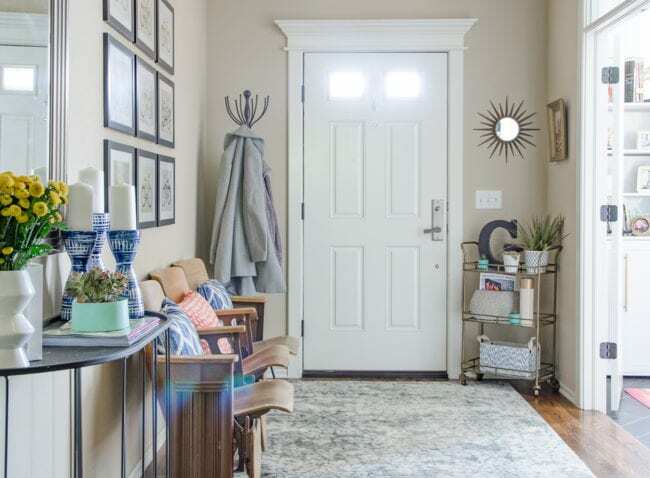 Obviously, the aesthetics and style are important to me, but you know that I’m also huge on function and thankfully Schlage is also obsessed with making homes smarter and safer. 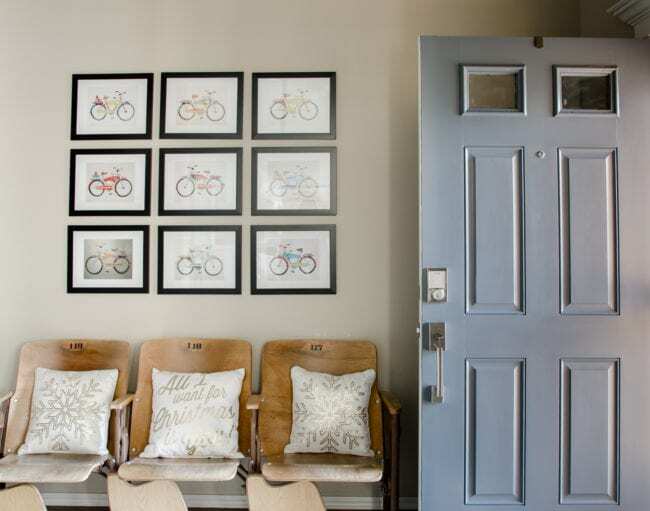 Security-wise, there are several benefits to switching to these locks. The locks come with long & sturdy screws for the plates. Did you know that the screws in your deadbolt plate are one of the most vulnerable parts of your home? Schlage didn’t tell me to say that, I saw a security expert on TV a few months ago who was recommending everyone swap out their short screws ASAP. I was thrilled when Corey showed me how much stronger the Schlage versions were compared to what we had before. You don’t have to give out physical keys (that can be duplicated) to anyone. Instead, they get a code that can be turned off at any time. You can set up a unique, temporary code for someone like a dog-sitter and set the days & times that the code will work. If you have a housekeeper on Monday mornings, you can set it up that their code ONLY works on Monday mornings. 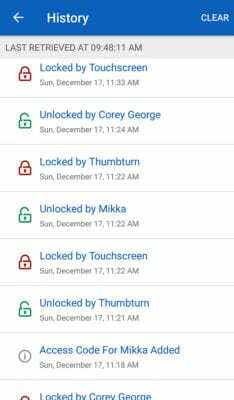 You can see when someone uses their code through Schlage’s app. Our neighbor has a key to our house, which is great because they’re always willing to come let Maddie out, but even though I trust them, for all I know they could be hanging out eating all my ice cream while we are gone. 🙂 Now they have a unique code and I’ll always know when they came and went. I also have our neighbor’s key, and often let their dogs out during the day. When I do that, I honestly never lock my own door because I don’t want to go dig the keys out of my purse when I know I’ll only be gone 5-10 minutes. Lazy, but true. Now I just touch the Schlage logo on the outside of our door to lock it, and enter my code to get back in! During the day, we’ve never locked the door between the garage and the house. It’s just easier to not hassle with the key, especially if I have groceries. Now, we can keep the door locked while we are gone in case someone gets into the garage. If I have things to carry that will prevent me from entering the code, I can unlock the door from the app on my phone (works with Apple iOS & Android) before getting out of the warm car! 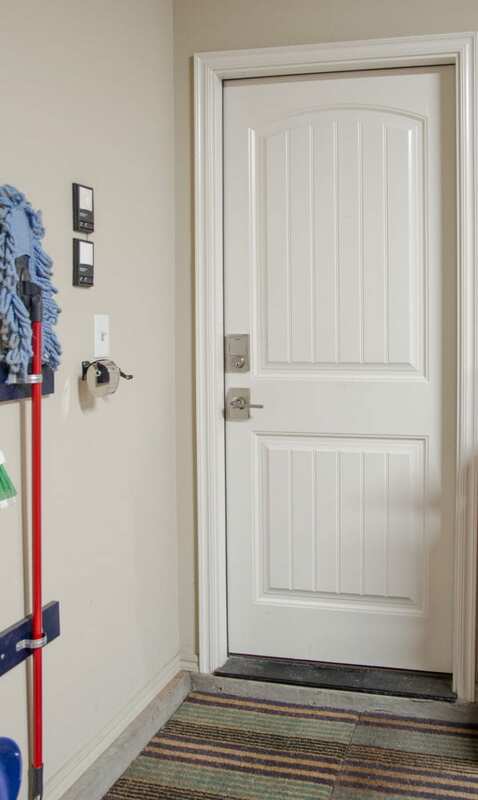 Being able to easily lock and unlock the garage door will also be great when we’re doing yard work. The deadbolts have an audible alarm if they sense someone is trying to physically break into the lock from the outside. There is a button on the inside to silence the alarm. As if all that wasn’t enough security and convenience, the Sense works with Alexa to lock the doors if you get the optional Schlage Sense Wi-Fi Adapter. Now when we’re laying in bed and can’t remember if we locked the front door after turning off the Christmas lights, we can say “Alexa, is the Front Door locked?”. 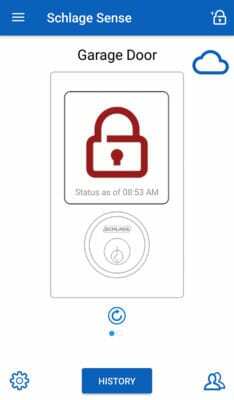 If you’re thinking this sounds complicated, it was easy to install both the physical lock and to setup the app on our phones. 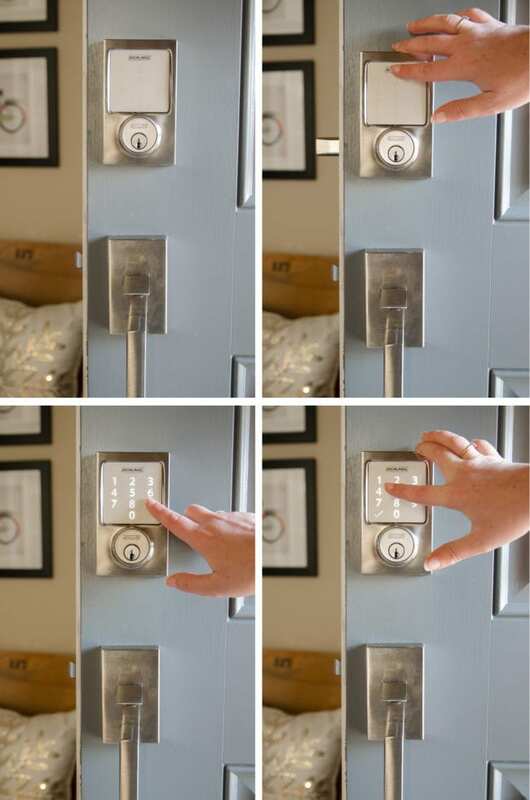 The locks install just like a traditional lock and it runs on batteries. There isn’t anything to hard-wire. As I mentioned, it was so easy that we added one to the garage door as well. If you click HISTORY at the bottom of the screen, you can see who has used their code. Managing users is also simple, just click the people icon in the bottom right to see everyone with access codes. You can add someone using the + symbol at the top, or click on their name to change their code or the hours/days they have access. You can have up to 30 different users set up. Oh, I almost forgot to mention, even though the locks have ongoing smart home features, there are NO ongoing fees to use the app! If you’re looking for the perfect last-minute gift for a parent, sibling, or spouse, this would be a great gift that keeps on giving every day. You’d be making the recipient’s life easier, safer, AND more stylish! 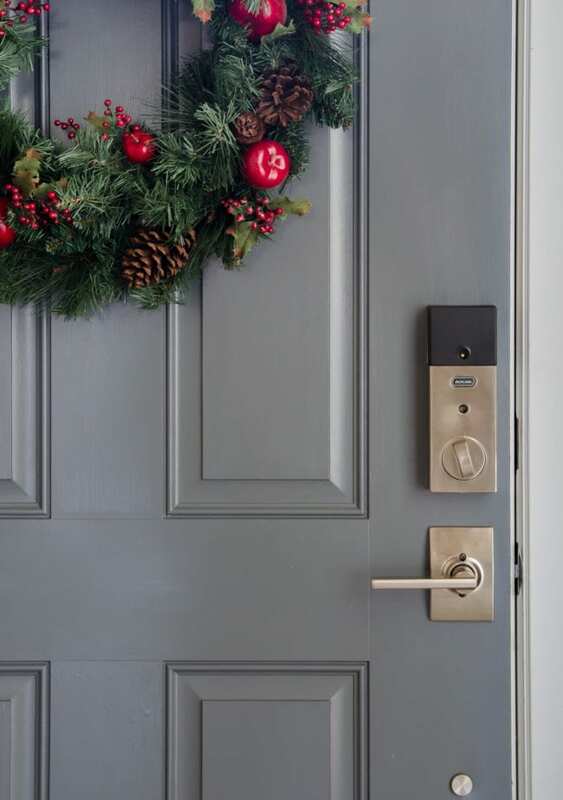 Head to your local Lowe’s today to pick one up without worrying about shipping deadlines, or if you make a purchase from 1/3 – 1/15, Schlage locks will be offering 15 percent off all electronics. 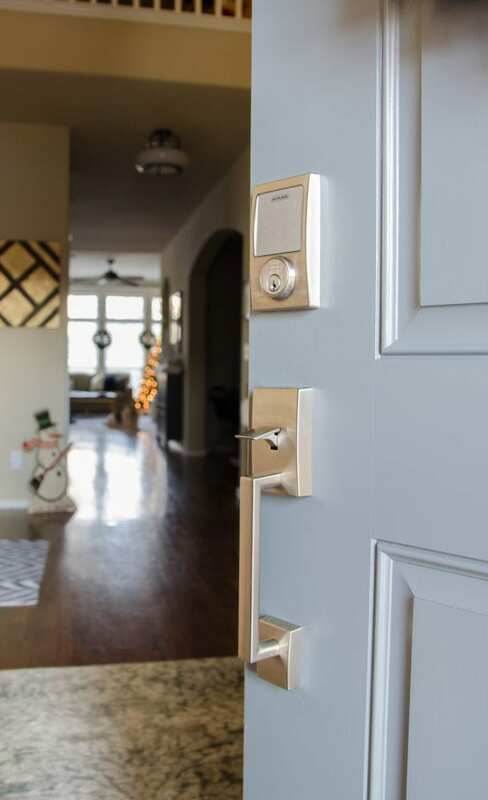 Schlage electronic locks come with a 3-year Limited Electronics Warranty – the best in the industry. Does anyone already have one of these? I’d love to hear if you love it as much as we do! I am so envious! This sounds incredibly convenient and it looks so good! I am loving the new front door color too! We desperately need a new front door which would be the perfect time to upgrade to this 🙂 And not locking the door between the house and garage……I don’t know anyone who isn’t guilty of this. Great solution! Thank you! We are loving it on the garage so much! Plusn someone else was at our house last week, and I noticed after she left, she forgot to lock the front door. I locked it right from my phone! So handy! I bought one today and will return it tomorrow, it claims to be a deadbolt but cannot be key locked from the inside, if you have a reach around window or need to “deadbolt” you door this product can’t do it, please show me how if I am wrong…. Hi David, different homes definitely have different needs and deadbolts come in different styles – both interior turn-lock (single cylinder) and key-lock (double cylinder) depending on the presence of a window near your door. We don’t have a window pane next to our door, so our previous builder-installed deadbolt didn’t require a key from the inside either. Sorry if there was something in this post that implied it was double cylinder/had an interior key, that definitely wasn’t my intention as it’s a keyless lock.